July 21 — Most respondents in administrative cases brought by the SEC's Enforcement Division lose—probably a predictable result. Perhaps more surprising: Most respondents don't appeal to the full Securities and Exchange Commission. Respondents appealed only 11 out of the 36 initial decisions—or 30.5 percent—in 2013, according to Bloomberg Law data on ALJ decisions. That figure dropped to 15 out of 63 or 23.8 percent in 2014, and 13 out of 60 or 21.6 percent last year. 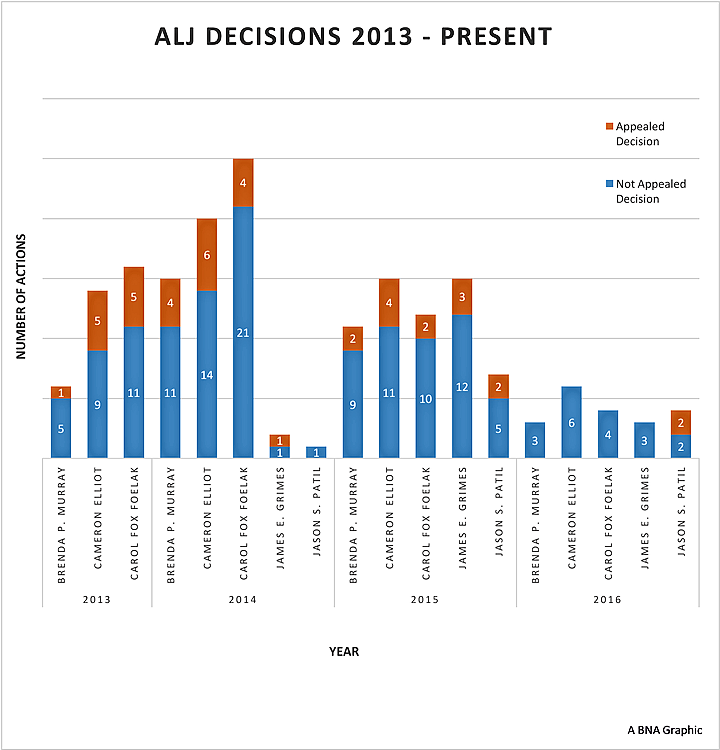 If the trend continues, the percentage of ALJ decisions appealed in 2016 will be the lowest in three years. In the first half of the year, only 10 percent—two out of 20—of the ALJs' initial decisions were sent to the SEC for review. There could be several reasons for the declining appeals. The appeals process is very slow, W. Hardy Callcott, a partner at Sidley Austin, told Bloomberg BNA July 21. “While the ALJs are on strict timelines, there is no timeline at the commission level so there are frequently cases that are pending for a year or two. I think that decreases the incentive of anyone to appeal,” Callcott said. Second, unlike the cases with appeals to self-regulatory organizations such as the Financial Industry Regulatory Authority, the SEC can actually increase the sanctions imposed by ALJs that fall below the statutory maximum, Callcott said. That risk could act as a disincentive to appeals. Finally, Callcott said, the agency's current configuration, with Chairman Mary Jo White and Commissioner Kara Stein, who are “perceived as very pro-enforcement and if anything, tougher than the enforcement division,” may also contribute to the dwindling number of appeals. Over the past three years, the SEC ALJs found for the Enforcement Division 93.2 percent of the time, according to the Bloomberg Law data. Out of the 179 proceedings brought by the division since the beginning of 2013, only 12 were dismissed. Three of those dismissals were partial dismissals, meaning that the ALJ dismissed proceedings against only some of the parties named in the action. One initial decision dismissed enforcement proceedings after the U.S. Court of Appeals for the Second Circuit issued its decision in United States v. Newman, 773 F.3d 438 (2d Cir. 2014), which made it harder to bring an insider trading action. In 2013, there were only three administrative law judges for the agency—Brenda P. Murray, Carol Fox Foelak and Cameron Elliot. That number was nearly doubled the following year with the addition of Jason S. Patil and James E. Grimes. Patil has the largest percentage—33.3 percent—of appealed cases of any current SEC ALJ. Patil has presided over 12 cases, four of which have been challenged and are still awaiting review by the SEC. The only two initial decisions appealed in the first half of this year were decided by Patil. Elliot's decisions are the second most appealed, with challenges to 27 percent—15 out of 55—of his decisions. Foelak has the lowest rate of challenges to her initial decisions, despite having issued the most decisions since 2013. In the past three and a half years, only 11 of Foelak's 57 initial decisions were appealed to the commission. The Bloomberg Law data tracks all administrative actions filed since the beginning of 2013 except for proceedings against defunct companies that are delinquent in their periodic filings. The data doesn't include proceedings still within the 21-day period for appeal to the commission. Cases currently on appeal are included even if the commission hasn't issued a final opinion. Bloomberg Law's ALJ Tracker is available to subscribers at: https://www.bloomberglaw.com/secondary_page/enforcement_tracker_sec_alj.